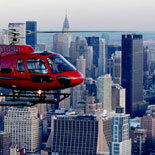 Experience the thrill of a helicopter flight and see the grandeur of Manhattan's famous skyline! Your tour begins by flying right past the historic Governor's Island which played an important role in the American Revolution, the War of 1812 and the American Civil War. Buildings on this island date back to the early 1700's. As you travel north up the Hudson River, you'll get a bird-eye view of Wall Street - the Financial Capital of the World, the Statue of Liberty and Ellis Island. Soar with the birds and enjoy a unique view of the Empire State Building, Chrysler, Woolworth, Met Life and other New York Cities skyscrapers, Fort Clinton, Central Park, downtown Manhattan and many other famous landmarks in a way unimaginable from the ground. 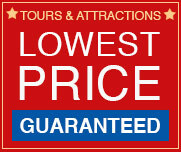 As you return you will view South Street Seaport and the famous Brooklyn Bridge and the George Washington Bridge. FLYING SAFELY FOR OVER 20 YEARS! 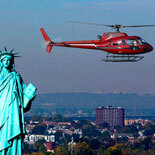 The largest Helicopter Sightseeing and Charter Service in the Northeast, Liberty Helicopters is currently the only authorized Helicopter Sightseeing Company in New York City. All aircraft and flight crews are certified and inspected to meet the demanding standards of the Federal Aviation Administration. Each helicopter seats up to 7 passengers (Tours are not private and may have other guests onboard) in a forward facing configuration. Flights departing Monday through Saturday from 9:00am-6:30pm. Please arrive 30 minutes early for check-in. Open Year Round. Heliport hours are subject to change. You need to confirm a reservation in advance. Ticket will have details. South St. & Whitehall St.
No parking provided. The closest parking area to the Downtown Heliport is at the South Street Seaport. It is a five to ten minute walk from that parking location. 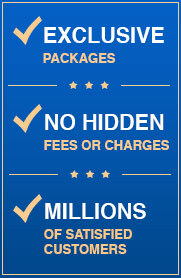 CHILD TICKET: Ticket price is the same regardless of age. Children under 35 lbs. are free of charge, provided they can sit on an adults lap.